This is yet another popular cycling summit in the Nice area, judging from all the bikes I saw going up. This is part of the greater metropolitan area and has more traffic than the area immediately north of here. North of the Col de Nice seems to be the cutoff point for heavy traffic. From East. The profile includes the most direct way to get to the Col de Nice from la Trinite, a suburb of Nice. Much of this route carries quite a bit of traffic. More circuitous routes to approach the Col de Nice are better rides, for example using its eastern approach or making a detour on the western approach over Cd321 (see the Col de Nice page). From the summit of Col de Nice, the road continues to this unnamed saddle in serpentines. 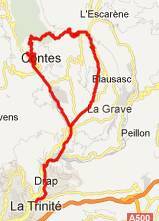 The point of highest elevation is at the junction with the short out and back road to the town of Berre-les-Alpes. The first picture shows the town from this approach. It gives a selective view, ie it cuts out all the construction cranes, modern houses, gas stations etc., all of which are not far away. Another picturesque vantage point of Berre-les-Alpes is from far below, as seen from the old town of Contes. Once you get inside the few streets of Berre les Alpes it may take relatively little time to explore them. Better to save some time for the other medieval town on this route, located at the bottom of the western side, Contes (second and third picture). From West. (described downwards) There is at least one other small sideroad that branches off about halfways down. It is also a named pass. But taking that descent misses Contes. Approaching that town, the road skirts the entrance to the medieval streets. No detour required for a walk back into time. The hill occupied by Berre les Alpes has been occupied since the 7th century BC, according to finds relating to a Celtic-Ligurian castelara. But the history of the town begins in the 11th century. We can assume that prior to this time shepherds from the village of Berre Peille grazed their stock on the hill during part of the year. Then a document from 1108 mentions the existence of seven castles, including on this hill. A time of major improvements began in 1355, when Gaspard de Berre restored and added to the buildings. D215 - D615 Berre-les-Alpes , additional out and back: 177 bd observotoire, Nice > col de Quatre Chemins(shp) <> out and back to Laghet > l'Escarene > col de Nice(shp) > Berre-les-Alpes s(u) > Contes > sp: 46.1miles with 4340ft of climbing in 4:16hours (VDO MC1.0 m4.12.5.14).